Just another update to the Helmet Saga, on my return journey to work today the sun(yes it does shine in Manchester on the odd occasion), Was low and shining directly in my face. I pushed the slider to lower the internal sun visor and ping it flew off across the motorway. God this helmet is totally pants. So far I have had 6 pins break, 2 visor mechanisms, and now a Sun visor problem. Ok right will you loan me a helmet? Then how am I to ride my bike to work? I asked if they could send me the parts and I will fit them. Answer “Eh no I don’t think so you will invalidate your warranty"
What is the point of the warranty when it spends most of its life not working properly. Well the parts are available on the internet for £34.99. What do I do now? 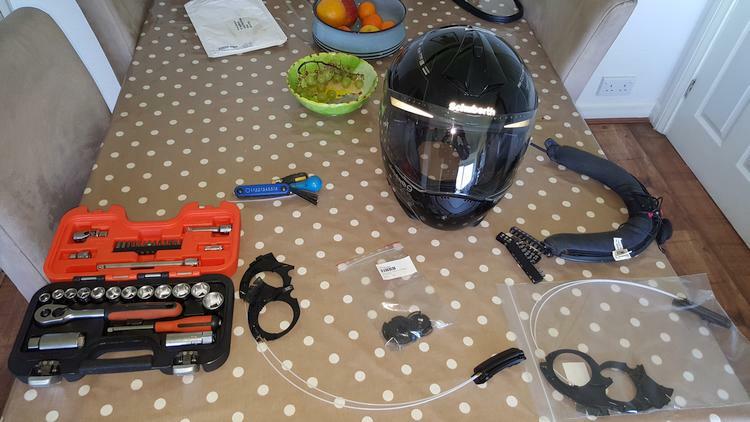 Fix it myself or wait for 4 weeks without a bike helmet, I have decided the best thing to do is chuck the damn thing in the bin and buy another but you can bet it won’t be a Schuberth. It has been beset by problems since day one and yesterday’s monsoon resulted in total blindness as the water swirled past my visor and under the visor in a total river running across my head.... 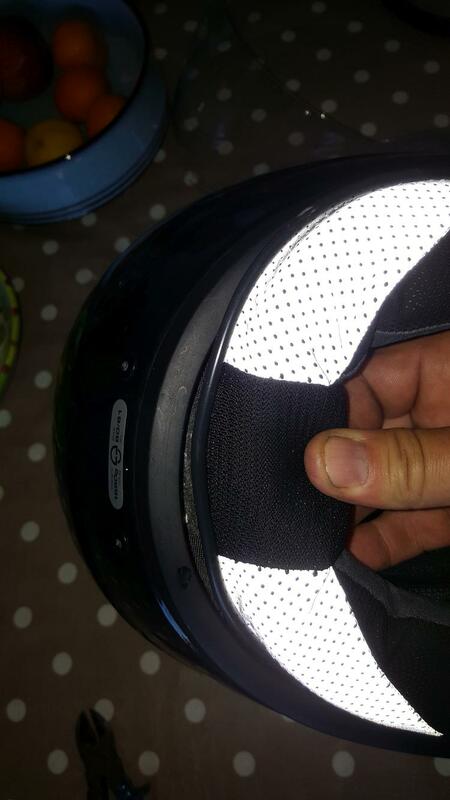 This I'm am reliably informed is caused by the bike screen causing turbulence behind the screen which caused a back flow of water down my helmet and into the back of the visor. Yep time to get a better helmet! This was my last entry regarding my helmet but the saga continues. I dug out all my old receipts and found the box my helmet came in. I was actually looking for the manual in case it showed which part numbers I had to order, if indeed you could actually order parts for the helmet? Inside the helmet box was my original receipt and guess what? It was 1 year and 362 days from the day I purchased the helmet. Guess what else the helmet has? A two year warranty. So I have 3 days in which to get it packed up and sent off. 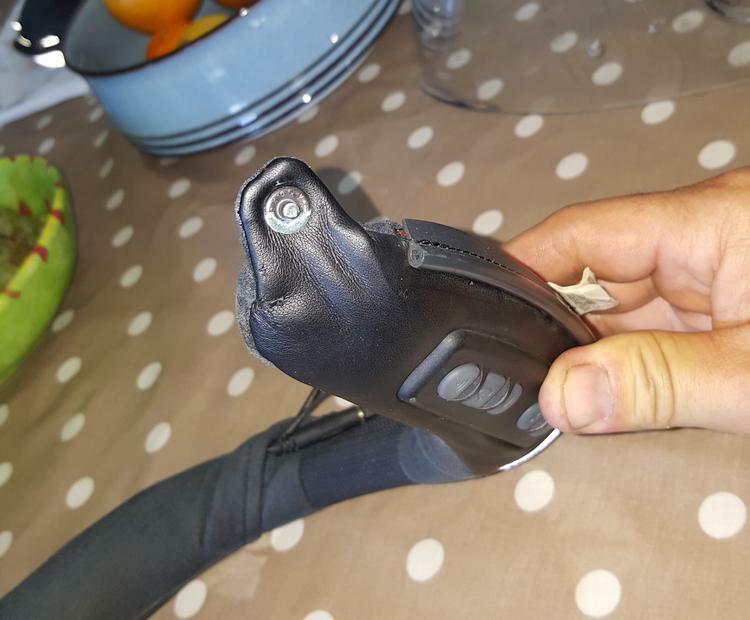 Firstly I needed a returns number so I ring Oxford Products who say they are no longer doing the warranty claims for Schuberth and that I should try the dealer. I ring the dealer who says pretty much that they are not interested unless I had taken out the extended warranty. Of course I hadn't I didn't even know it was an option. They tell me "Tran Am" is now doing the warranty. I ring them and they say contact Schuberth as they won’t receive the helmet by the time the warranty expires. Hmm. Passing the buck. Once ordered I decide to slag off Schuberth on their own Facebook page. Hmm then I find they have customer comments and reviews. After a particularly good slagging off of the helmet they actually respond to my wife's Facebook page (I presume they are getting confused as she also has a Schuberth M1 helmet). A little bit of good news is that I am registered for the extended warranty. Apparently I entered the serial number of both helmets and activated the warranty when I downloaded the app for the communication systems. So all is not lost except for the fact they still want me to post off my helmet which will render me bike-less for a week or two. Also I have just then wasted £34.99 for a part when I can now get it free. God, damn. I know I'm well off but even I don’t like wasting £34 especially on this crap helmet. I speak to them via a few emails and the general reply is how dare I want to fit the part myself how could I actually be able to manage this tricky project it's a specialised job. For once and in hindsight they are probably right. 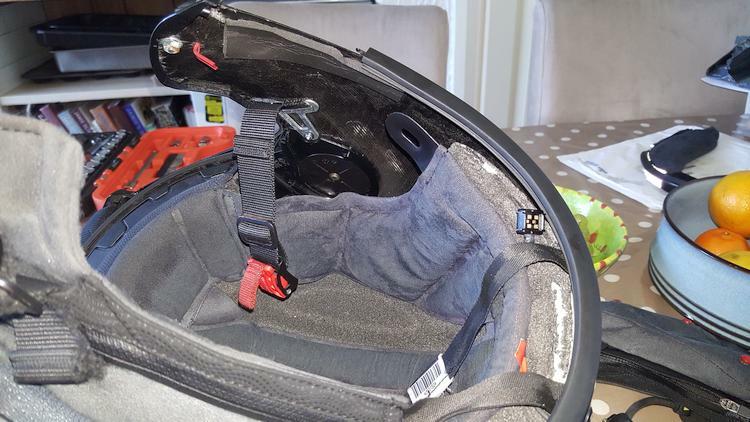 The following tale is how to or how not to take apart a Schuberth C3 pro helmet and replace the sun visor mechanism depending on your point of view. I personally have much more important things to do with 2 hours of my time. Remove the neckroll pulling it from the back not the front. Gently ease it out pulling the edge out and pulling the front locating pins out towards the back of the helmet. This prevents you from snapping the pins. Don’t forget to remove the hidden press studs at the front. Damn as you can see the plastic pin has again snapped off the front of the neck roll it fits into the tiny hole in the vinyl ring around the roll. The other pin has already been replace by a now rather corroded bit of coat hanger wire but it still working and in place (Quality English Engineering). It is not seen once the roll is fitted. Find a suitable wire in this case one of my wife’s white Ikea hangers. Drill out the old plastic bit using a tiny drill bit. Then push in the wire and snip of the end leaving 8mm sticking out. 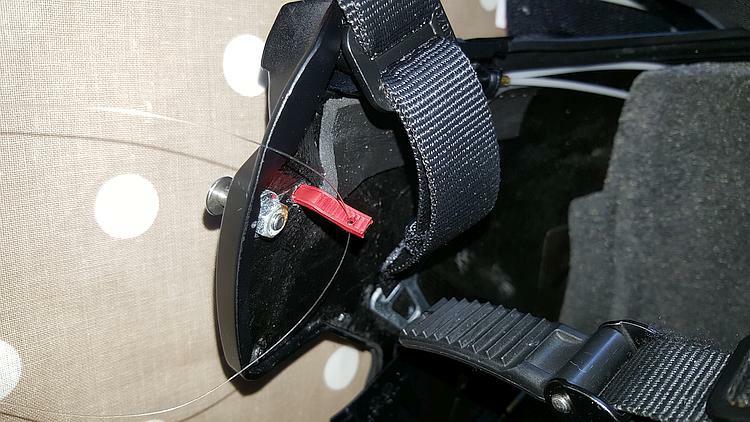 Disconnect the communication systems aerial by unlocking the small box connector on the rear (you can see the contacts just at the rear of the helmet). 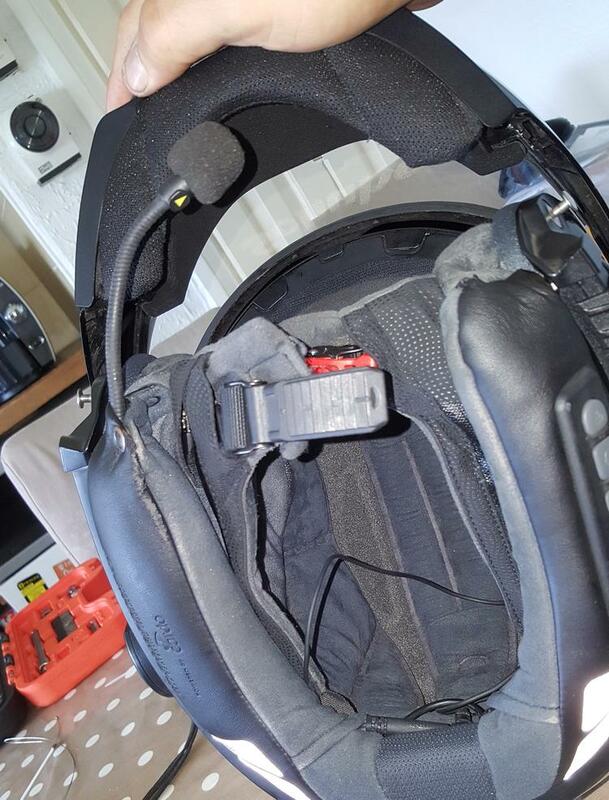 Remove the speakers from the Velcro patches holding them in place. They are hidden behind the cheek pieces which can be peeled back. Very gently as the wires are really thin. Remove the charger cable and the transmission aerial. Remove the Helmet Liners. This is in 3 parts the centre and the two cheek pads. These are fastened by 3 x red large press studs/poppers. Remove the cheek pads first. If you do the cheek pads first you can get the poppers out. Then the top. 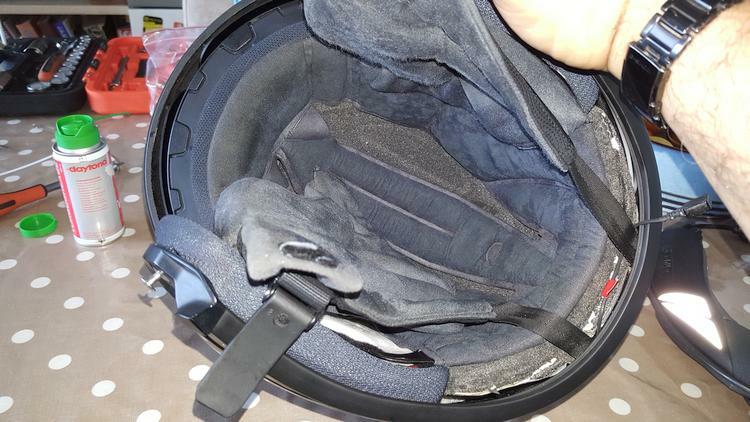 This will expose the inner liner of the helmet which appears to be made from expanded foam or polystyrene. 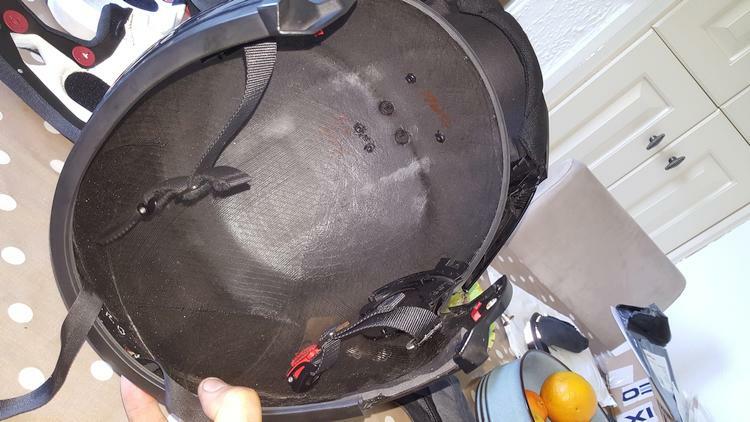 There is a cable from the back of the helmet which has a loop on the end which the helmet fasteners pass through on each side. This is the anti roll off system. Take a picture so you know how these go back together its really complicated where the cables are routed on each side. 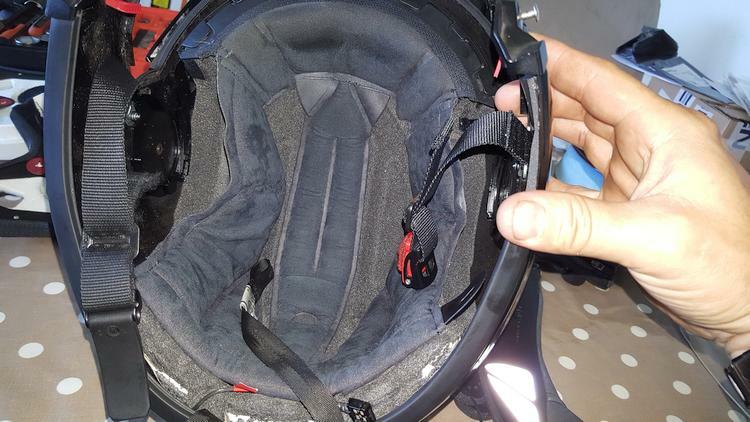 The helmet has an anti roll off system which stops the helmet coming off in case of an accident. 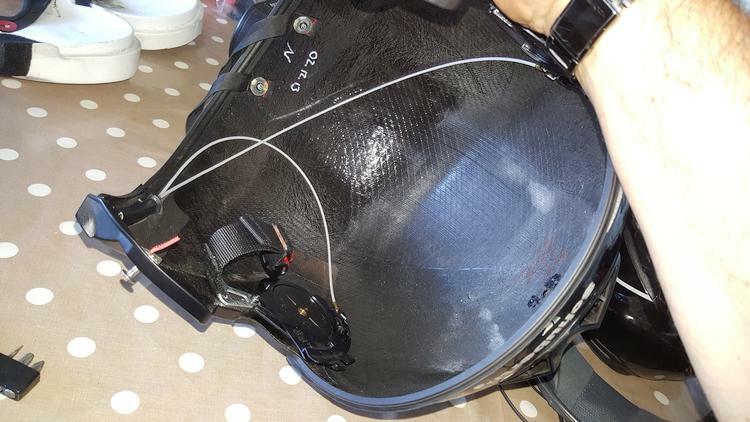 This consists of cables which go from the rear of helmet through the cheek pads and the helmet catch passes through a loop in the end. 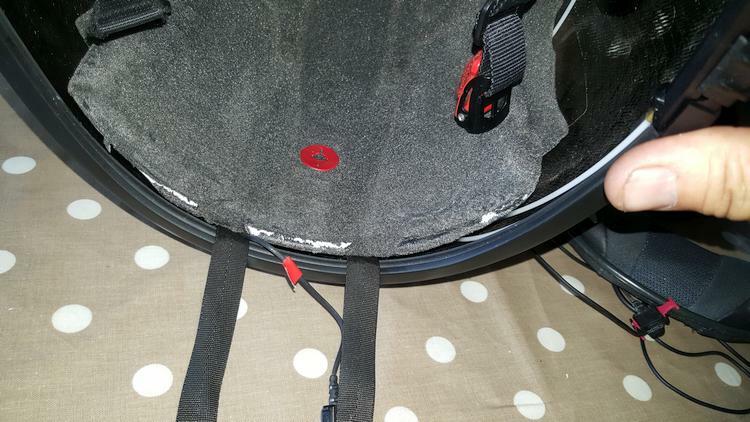 Cross looping means if the back of the helmet is lifted in a crash it pulls down the back against the front fastener. The idea is that any force is counter acted by the opposite strap. 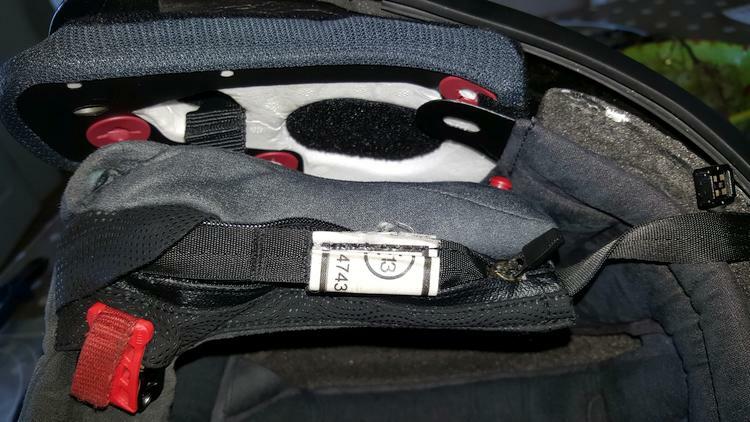 These straps are fed through the pads and hidden by two zips. These zips are really tough to move. They are extremely tight and difficult to get off. Much swearing and pulling and pushing later and the cheek pads were out. I cannot see how the middle can be removed it seems fixed in place. No visible screws or other means of fastening it in. 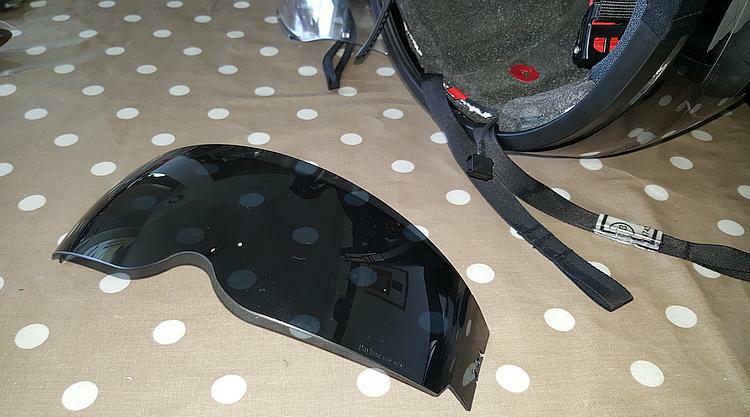 The cheek pads seem to wobble a bit, eventually I pull the cheek pad really hard and it pops off. It is held in place by some sort of cable tie which is slightly different as it can be pulled both ways it just acts as a holder. 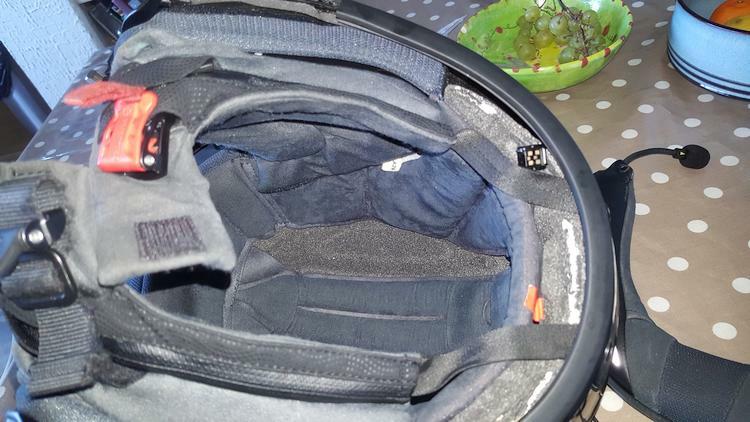 I pull both off and I can see the mechanism at the sides but cannot access the sides which are still covered by the main part of the helmet liner. This has to come out but it’s not moving. Eventually I realise it won’t move until the sun visor glass is removed. This unclips it’s a bit tricky but eventually it pulls out in one whole piece I’m glad as It costs about £40 for a replacement. The inner liner eventually pulls out but I can't get it out of the bottom of the helmet, it’s a tight fit but with much wriggling and head scratching it pops out. It’s a moulded bit of foam/polystyrene.You can see the transmitter/aerial hidden in a groove around the top of the helmet. 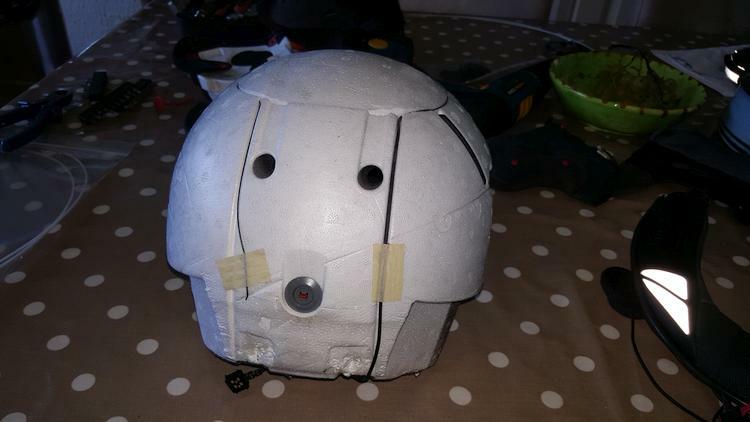 This leaves the entire shell exposed and finally access to the helmet interior. I then realise I must remove the entire flip visor to access the mechanism. 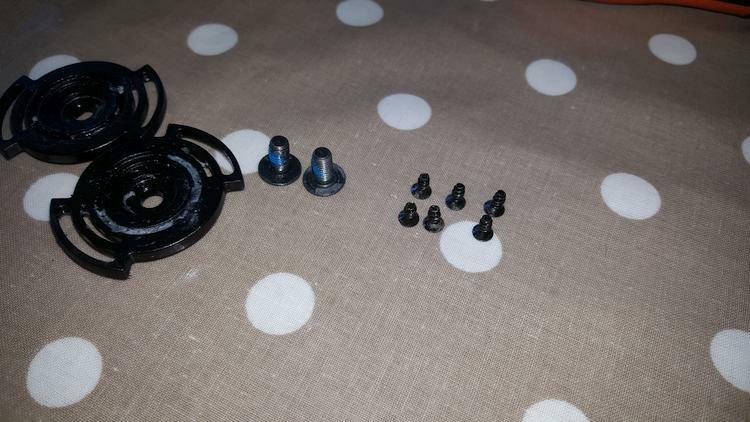 I have a small Allen key to remove the visor, it won’t move the nut has seized. WD40 and much messing about it eventually moves and I remove one side. The other will not budge. I decide to drill it out as I have rounded the Allen key off. I drill it out and manage to get it out without damaging the thread. The two helmet splines and nuts are shown here. 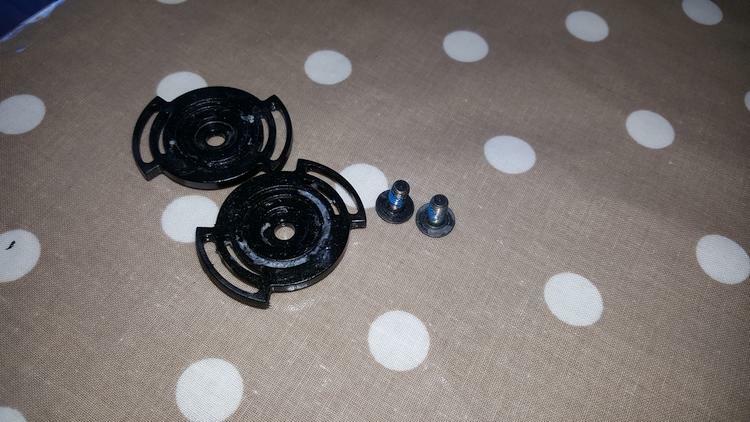 I am fortunate that I have a spare kit which has a replacement screw set in. But where did I leave them, half an hour later found them in my wife’s sewing rooms buried with a missing walking hat and my tank bag. I now remove the screws holding the slider in place. Oops they don’t appear to be Allen keys, god my eyes are bad, They appear to be very small torque screws. I have none that fit they are simply too small. Off to Homebase, no luck Halfords, no luck, eventually find them at B&M...£3.99. 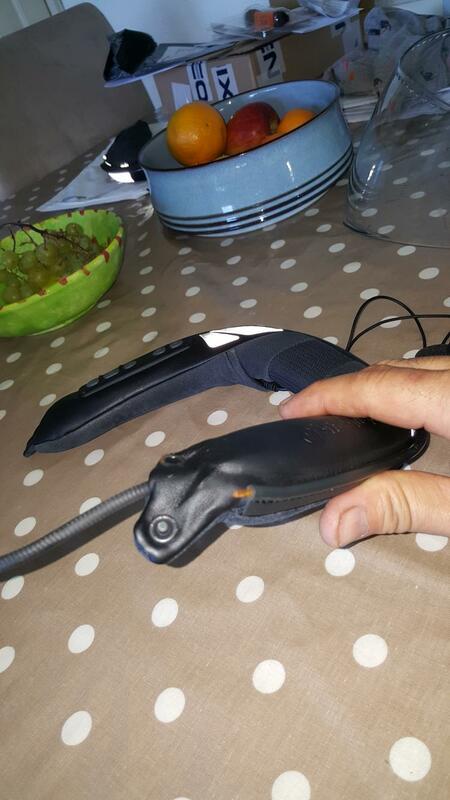 I remove the slider and realise they don't hold it in place it's held in place by a rubber sticky pad. The screws hold the slider mechanism together as its already broken I suppose this doesn't matter. Three more torque screws hold the mechanism to the visor pivot.They have a matching set on the other side. They come out with a little brute force I can then feed the cables out and start the rebuild. The slider section only has one screw but the one I took off had two. Both the new ones I received only have one screw. Good job I kept the original. 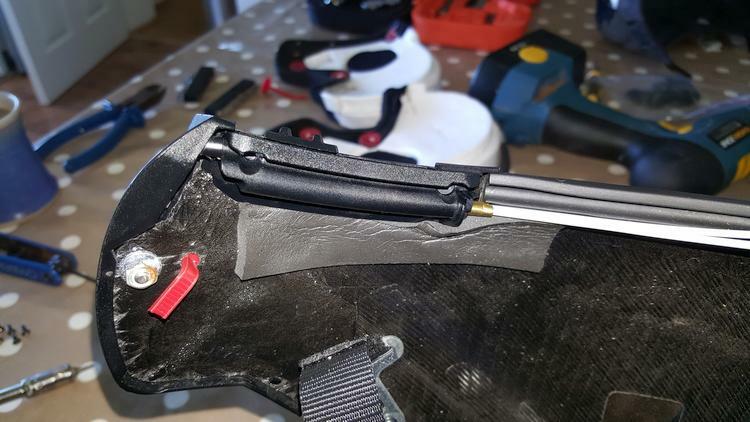 It has two clips either end that slide into the edge of the helmet shell you have to carefully and with some effort bend the frame to slide both ends under the slider. It’s tricky as one end keeps popping out as you do it. Put the bit towards the back of the helmet in first then bend out the front of the helmet push down and backwards. Once its in place hold it tight and put the front screw in without releasing the pressure otherwise it pops out. You need three hands to do this. 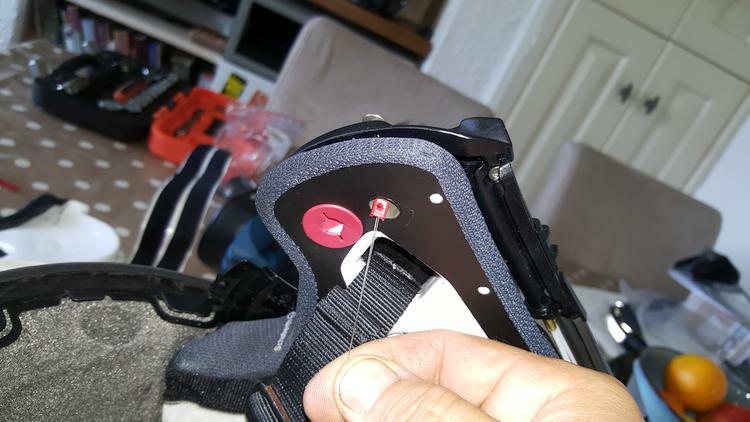 You can see the slider and the red fastener, not sure how am I going to get this back in place. I replaced the visor parts and screwed them in place. OMG the new Screws are not Allen Keys or torque screws they are some sort of star shape. A trip to Halfords and I find a small enough set. 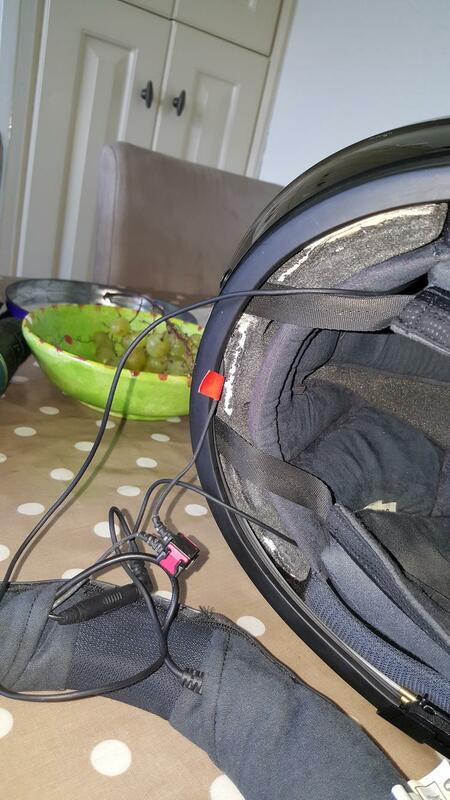 One of the cables is longer than the other obviously to reach the far side of the helmet. You can’t get them wrong as one won’t reach. The rebuild can now begin. Make sure the slider is working and that the sticky pad is holding it in place. Insert the main helmet insert make sure the straps and leads are all outside. The red tags are flexible I suspect when the helmet was first made these were much longer and are fed through the hole in the cheek pad then they are pulled tight and trimmed off. They are glued into the main shell. Damn they are part of the safety system to stop the inner shell moving within the main shell in case of an accident. Can’t see what I can do. Then a brain wave occurs from Paula’s Sewing room. 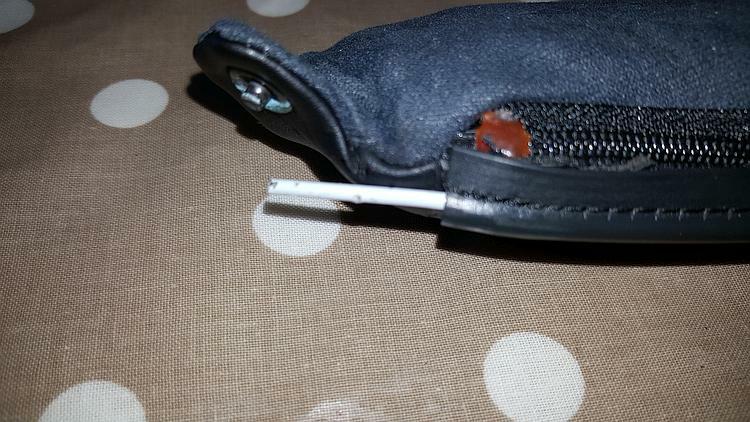 I make a small hole in the end and insert a bit of fishing wire insert it in the tag and out through the cheek pad hole. I press the cheek pad in place and gently pull the tag through the hole and into the ratchet that holds it in place then I can grip the tag and it to lock the cheek pad in place. Bingo! Repeat for the other side. Check it works. Yippee it does. I reinsert the padding and spray my Daytona zip lubricant on the cheek pad zips to ensure they move a little smoother. I spend 15 minutes feeding all the anti roll cables in. It’s time to put the main visor on you will notice I have inserted some rubber pads between the visor and the ratchet. 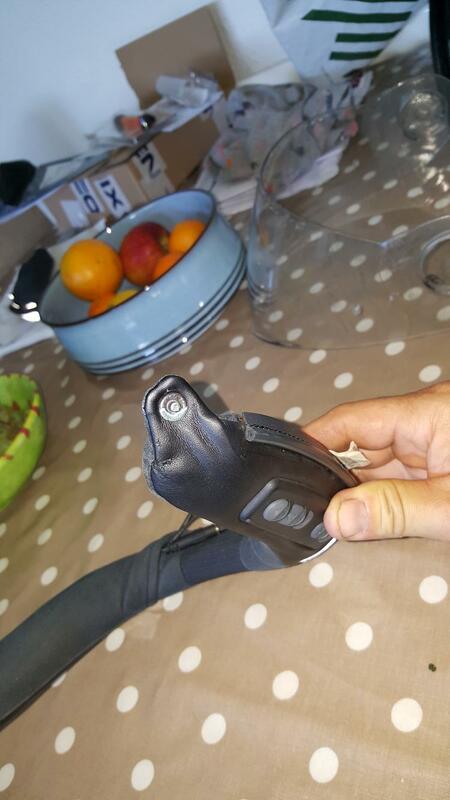 This causes friction on the visor meaning it won’t lower itself at 40 mph it will stay in place up to 80mph. Again such poor German Engineering. The whole process took nearly two hours not including the time spent shopping for the correct tools. I mean what is up with screws and simple nuts and bolts rather than every possible bloody tork/star trek crap screws. God what pain. I think I should have purchased another helmet and sent this one off. I could have kept it for those days when I venture out with Paula and need the communications system to listen to the nagging. However it’s fixed now, all I have to do is send back the spare mechanism, they will take it back into stock for the cost of postage. This helmet is Comfy and nice and quiet but full of stupid design faults. Unlike my Daytona boots which are purrfect. 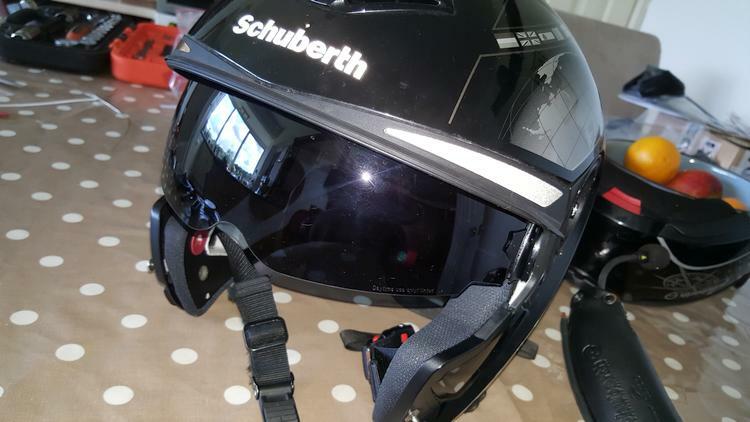 My advice is don't buy a Schuberth Helmet unless you want numerous problems. More Images - click on the image for a larger image. 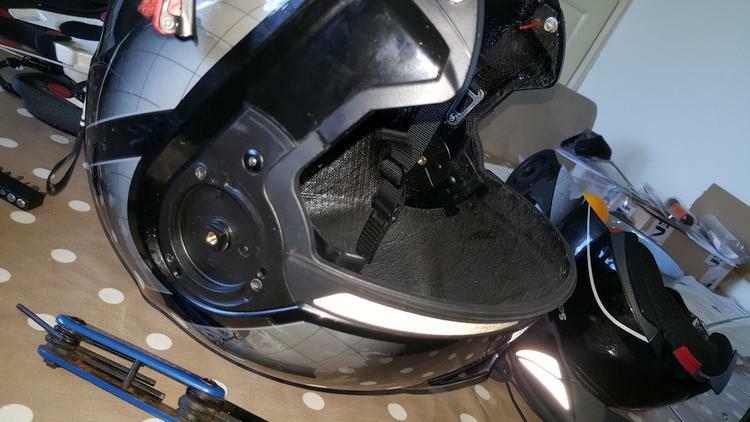 I've fixed a lot of motorcycle bits over the years, I've replaced a few visors and of cours the AGV visor click things I've talked about on here. But I've never ever taken a helmet totally apart like PocketPete's had to! It was interesting to attempt the repair. But I pray I never have to do this again. All told best part of 3 hours wasted. It would be easier to strip an engine down. Just as an extra note I returned the part I ordered to bikerbargains. They were absolutely great. No charges simply great service. I emailed them and told them about my 5 year warranty. And the answer was no problem send it back with a copy of the email. Full credit within 24 hours. Mine just quit working after 2-1/2 years. I didn't drop it, force it or anything else! It just quit operating!! Very upset!!! Yes quality german engineering my visor ratchet snapped off today. Good job I purchased a spare. Another £ 14 wasted on this helmet. That's appalling. Have you spoken to Trading Standards? Mind you, with council budgets having been slashed due to ill-advised "austerity" many of them have virtually closed down. Well the best thing is to do real reviews so that other people don't buy that particular item. It's such a pity as the helmet is good in concept. I still think they'd pay more attention to a prosecution by Trading Standards. 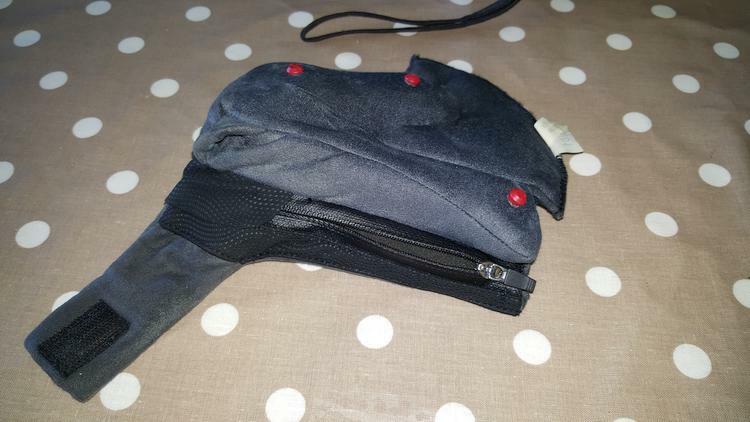 Might even be worth taking the retailer to small claims court on the basis the item is unfit for its designed use. It's a nice easy process, doesn't cost much (and you get it back if you win) and for those of us with a bit of spare time can be quite fun. 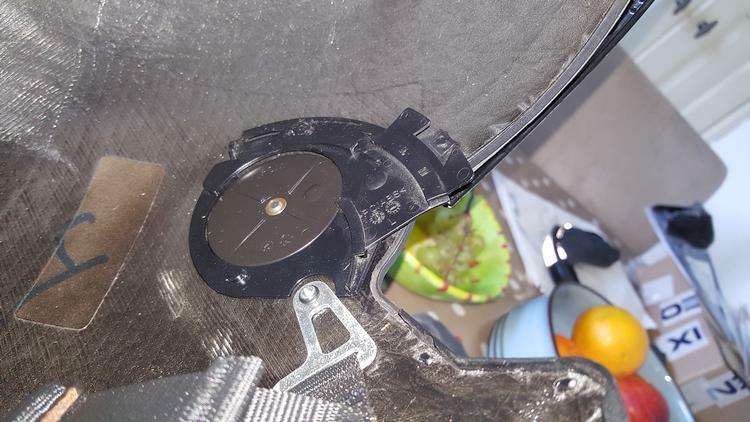 hi i need the sunvisor cable mechanism where can i buy one? 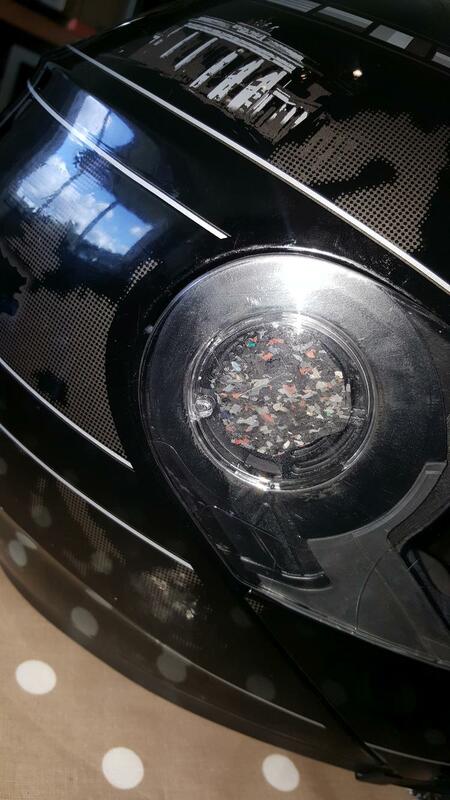 Or if your helmets in warranty you can send it off and they will fix it. Or they will send out the part free of charge. It took me 2 hours to replace it. No hard just awkward. Cheers Pete, I had nothing!